Welcome to GaVS! I will be your child's English teacher for Spring 2016 with GaVS. 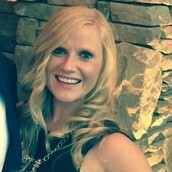 I graduated from the University of Georgia with a degree in English and Spanish, from Georgia State University with a Master's in Secondary English Education, and from Georgia Southern University with a Specialist degree in Teaching and Learning. I am also AP Certified, Gifted Certified, Reading Certified, and ESOL Certified. I have been teaching with GaVS for 5 years, and I taught face to face for 8 years. I am currently working full time for GaVS. The information included in this newsletter will guide your student to helpful resources as well as steps to take as they begin in this course. If you are new to the online environment, I am here to help you through this transition. In the online world (much like a face-to-face school setting) success is achieved through common effort of student, teacher and parent. As you encounter questions starting and working through the course, please do not hesitate to contact me. I am here and available for each of you. 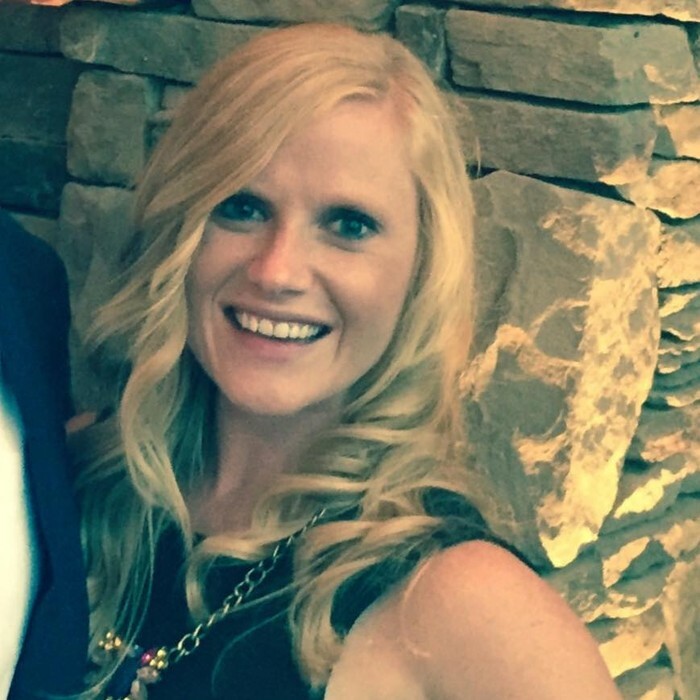 · students make a 100% on the final Student Orientation Quiz. Students may choose to opt out of the Student Orientation Course; however, students who elect to opt out of the Student Orientation Course are still responsible for all content presented in the course. Students must finish or opt out of the SOC before gaining access to the course. It is possible that students will not gain access to the course until the first start date or one workday after the semester has begun in January. The "Content" is like your textbook and where you will find all of the study materials and assignments. Please DO NOT skip through the content--make sure you view, read, and study each page. **As soon as you have entered the course, read the Bulletin Board and print your (18, 16, 14, or 12 week) schedule on the Course Homepage. The schedules are in the "Course Information" box on the right side column on the screen. Read through the schedule to see what is due daily. Work the schedule in order. 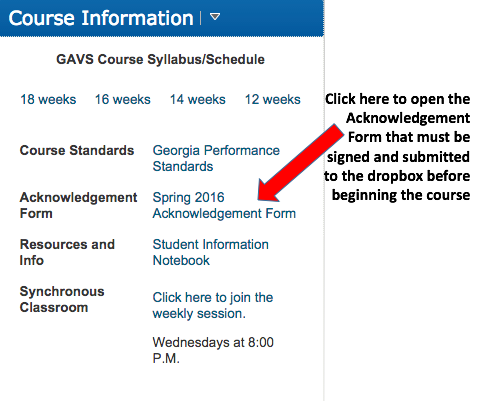 **The Student Acknowledgement Form is located beneath your Course Schedule and must be signed and submitted to the appropriate dropbox. 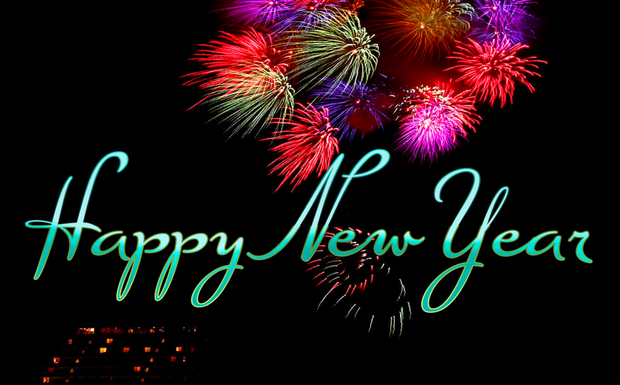 **The Welcome Chat will be on Wednesday, January 6th at 6:30 P.M.
**Use your GaVS Username@gavirtualschool.org and Password to enter the room. If your username and password does not work, enter the room as a guest. You are expected to login and participate in your online course on a DAILY basis. Fall/Spring semester: Plan to spend at least 60 to 90 minutes per weekday (5 to 8 hours per week) for a half unit course or 90 to 120 minutes per weekday (7 to 10 hours per week) for a 1 unit (AB or block) course. The estimates above are per course, so if you are taking more than one course, please plan accordingly. Technical difficulties are not an excuse for assignments to be late! Please be aware of the pacing guide and due dates for all assignments. Extensions past the last day of school will NOT be granted. Student work is due bi-weekly on THURSDAYS at midnight EST. 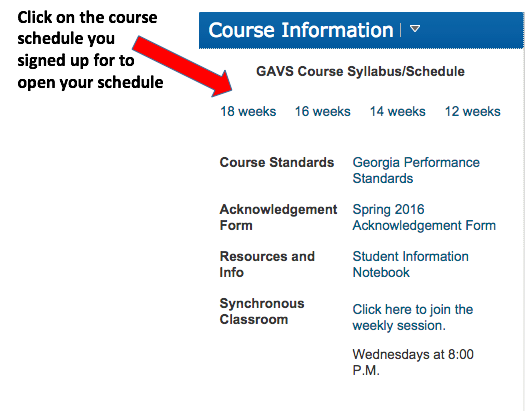 Check course schedules for specific due dates. Work turned in after the deadline on the course schedule will be accepted within 3 school days following due date with a late penalty assessed. Late penalty begins on Friday and is deducted at a rate of 10% of the assignment value per school day. Work submitted on Friday, Saturday, and Sunday is considered 1 day late. At the end of the semester, all class work must be submitted prior to the time period the final exam is available. Thus, if final exams begin Wednesday of the last week of school, all other assignments which can still be accepted based on course schedule due dates, except the final exam, must be submitted by Tuesday of the last week of school. Fall & Spring late work policy example: David turns in an assignment at 3:15 pm on Sunday. He scores a 7 out of 15 on the assignment. David will lose 1.5 points on this assignment (15 * .10) and the score recorded in the grade book is 5.5/15. A note should be made in the grade book detailing the late work deduction. Technical difficulties are not an excuse for assignments to be late. Students must have computer access to complete GaVS work. It is the student’s responsibility to secure backup computer options when technical difficulties arise. Many public libraries offer computers with internet access. Additionally, GaVS courses can be accessed on a variety of mobile devices so it may be that a mobile device could be used to complete some coursework when there are computer problems. 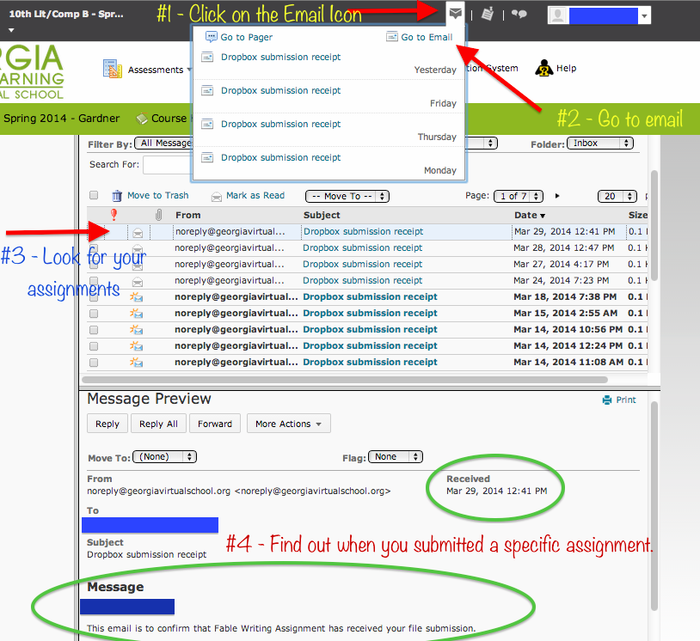 Sometimes students submit a file that the teacher is not able to open. 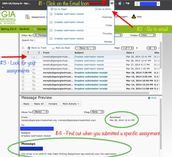 When that occurs, the teacher will leave feedback notifying the student, and a zero will be entered into the gradebook. The student then has up to five school days to submit a readable version of the file without penalty. 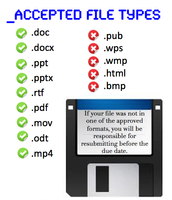 Students are expected to submit all subsequent assignments in a properly formatted file type. Five school days after the teacher has notified the student of the file issue, the standard late policies apply. When a student switches to a shorter schedule, any assignments that have been completed cannot be resubmitted. Any zeroes already entered in the old schedule not yet due on the shorter schedule can be replaced. Zeros previously earned will not be removed from the gradebook but will be replaced if assignments are submitted by the shorter schedule due date. If a student is suspended from the local school, GaVS course access remains open. Unless a student is directed otherwise by the local school, he or she may continue working in the GaVS course while suspended at the local school. Note that under no circumstance is a school suspension grounds for an extension under the GaVS late policy. *If you are a special education student and would like GaVS to consider making accommodations for you, please email a copy of your IEP or 504 plan to Sarah Newman at snewman@doe.k12.ga.us or fax a copy to 770-357-3704. If you do not have a copy, please contact your facilitator. The Parent Account gives you information about your child’s grades and progress in their course. If your child’s grade drops below a 75, you will receive an automated phone call. If your child’s grade drops below a 70, you will receive a phone call from me. However, FOR REAL TIME GRADES, please log in to the student account and click on "Assessments" and then "Grades"--this will show you each individual grade of your students, what your student is missing, and when it was due. For the parent account...if you already have a parent account please do NOT create a new one. 1) Please check to see that your parent account is linked to your student’s account. 1) Log in to GAVS at www.gavirtualschool.org and at the Log In page type in your username and password. *Information for parents who have NEVER created a parent account. 3) Click “Create An Account” from the navigation bar. 4) You will need to know your child’s GTID and date of birth. 5) Please follow the directions on the screen. 6) Be sure you have linked your parent account to your student’s account. 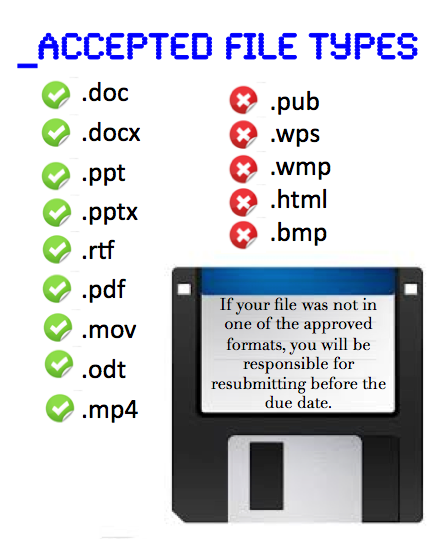 When you submit work to GaVS, please be sure it is in one of the file types listed above. 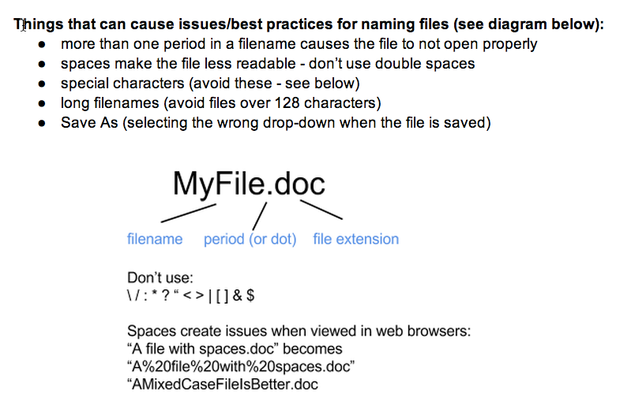 If you use Publisher, Pages, or another program, be sure you can export the document as a PDF or other file type indicated with a green check above. How do I take quizzes or tests using the quizzing tool? How do I view feedback on quizzes and tests? How do I view my grades feedback? * Students are expected to use MLA format on all writing assignments. * All work quoted, paraphrased, or summarized from other sources should use an in-text citation. * A sample first page of an MLA style paper/assignment can be seen below. Unless your teacher expressly states otherwise, all work must be original and entirely the student's own work without any outside help which includes other students, parents, textbooks, internet or any other outside source. Assignments that require documentation and/or references must adhere to guidelines presented by the teacher. 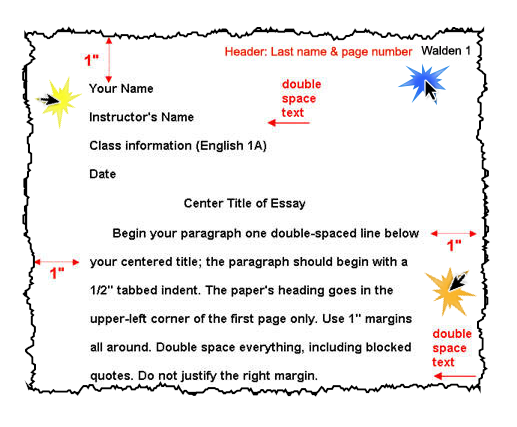 When in doubt, clarify with your teacher before beginning an assignment or submitting it. If you are a special education student and would like GaVS to consider making accommodations for you, please fax a copy of your IEP or 504 Plan to 770-357-3704. If you do not have a copy, please contact your facilitator. * Please note that GaVS teachers cannot make accommodations without a copy of the plan on file. * A copy of the plan must be submitted EACH semester. 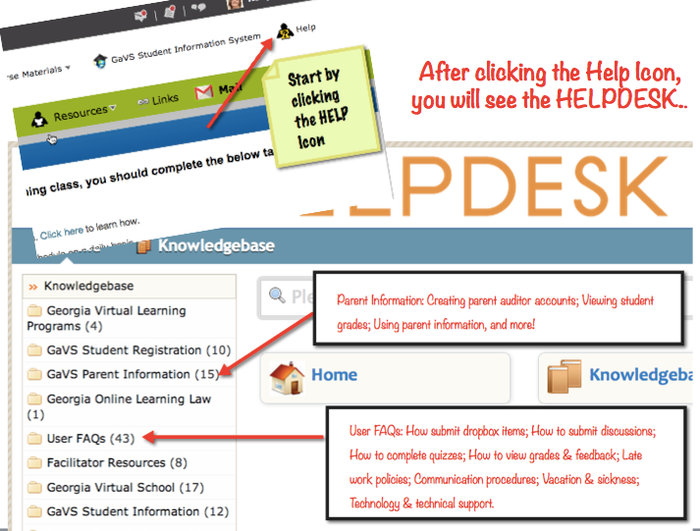 Click here to use the GAVS Helpdesk/Knowledgebase! 2. Look within the news announcements (in the Course) or other communication from me. 3. Familiarize yourself with the Student Handbook: Click here to access the Student Handbook. 4. Feel free to contact me directly via phone or email. Please always include your name, course, and schedule (18, 16, 14, or 12). * Medical situation (hospitalization, extreme sickness, injury): Contact me BEFORE a due date if you have been too sick to complete work. Please note that a note from the doctor may be required to authorize any extensions for sickness. * Technology emergency: Please notify me BEFORE a due date if you experience a technology issue. If you lose power, get kicked out of a test, have a computer crash, or other extreme situation, please let me know immediately. We understand that these things happen, but also expect students to have a back-up plan for technology issues. Plan to use a computer at school, the library, a friend or family member's computer, etc. * General Assignment/Course Questions: These are best answered by email, but feel free to call me as well. If you need me, please feel free to email, call, or text. I am usually able to answer emails or text quicker than I am able to return phone calls, but please feel free to do either.